We chartered Stryder, a Dufor 34, in Little Current, Ontario. Steve handled the arrangements and signed a seven-page charter agreement with an early Sunday departure, returning the following Saturday. The owner accepted Steve’s verbal resume of our combined sailing skills and experience. He allowed us to sleep aboard Saturday night before the charter commenced in exchange for returning the vessel by noon the following Saturday. The vessel came completely furnished except for food provisions. The more-than-adequate galley area included a refrigerator and oven. The spacious V-berth and quarter berth came with bedding. As the shortest of the three, I provided my own sleeping bag for my main cabin berth. Topside rigging included furling main and jib sails and a remote-controlled anchor windlass. The cockpit, partially shielded by a dodger, also contained an expandable shower hose and showerhead. The navigator’s area held charts and piloting supplies, and the helm station contained an array of electronics, including GPS. We had previously decided to sail with the wind and had a few popular destinations in mind. Sunday’s westerly winds prompted us to set sail for Baie Fine, North Channel’s version of a Norwegian fjord. We enjoyed an excellent sail out of Little Current and across Frazer Bay before securing sails to enter Baie Fine. 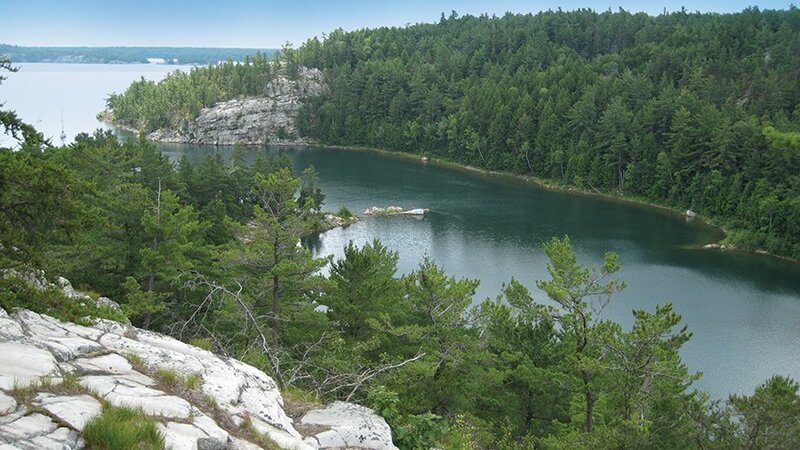 We enjoyed the spectacular scenery while motoring to a little cove called the Pool at the east end of Baie Fine before returning partway to set anchor near the west end of the narrows. Most evenings we played Euchre, Scrabble and Mexican Train Dominos. However, on this particular night, Steve also entertained us by catching a small-mouth bass, which we added to our Saginaw Bay perch dinner later in the week. 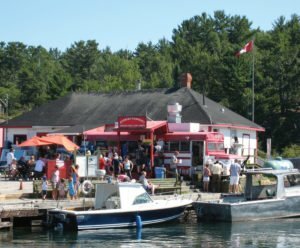 The next day we had favorable winds and sunshine while sailing across Frazer Bay and up Lansdowne Channel for a mid-afternoon lunch of deep-fried whitefish and chips at the famous school bus in Killarney. The food and outdoor ambience were worth the 45-minute wait. We saw our first boat drive-in theater while moored at the George Island docks across from the Sportsman’s Inn. A large white screen hung from the cliff, and a wood tower supported the projector. The sound was available via VHF and FM radio. This North Channel innovation provides some nighttime relaxation for those who’ve spent a full day absorbing nature’s beauty. After lunch, we left Killarney and sailed to nearby Covered Portage Cove, another popular North Channel anchorage. On Tuesday, our luck continued with sunshine and favorable winds that gave us an enjoyable sail as we headed west and north to the Benjamin Islands. We stopped briefly in Little Current for a pump-out and some additional last-minute provisions. As we approached the Benjamins, the winds intensified and shifted southerly, negating our desire to anchor in the popular South Benjamin cove. After briefly checking out the crowded North Benjamin anchorage, we opted for the well-protected southwest side of Croker Island two miles to the east. The winds shifted back to the east and blew hard well into the next morning. The sun disappeared Wednesday morning as we sailed around Hook Island with both sails reefed and winds clocked at 28 knots. Wow! We wisely secured both sails after rounding Eagle Island’s Proudfoot Pointe and proceeded to motor through the Boyd Island-Lumsden Rock area en route to Bear Drop Harbour. A few years earlier while on this same passage, Major Dad II had come out of a dissipating fog, ventured a couple of miles too far west and run aground on a rock near Sampson Island. The GPS proved more correct than my visual recollections of previous travels! We continued to Whalesback via Little Detroit en route to our anchorage at Bear Drop Harbour. We motored most of the way due to light winds. The disappointment of not sailing was partly mitigated by a clearing sky and otherwise pleasant weather. Howard and I agreed to let Steve try some serious fishing. He had done well several weeks earlier on a fishing trip with my brother, Mike. On Thursday, we left Bear Drop to begin our return trip and headed easterly down the Whalesback Channel. At Steve’s request, we set anchor midday at the south end of Coursel Bay, the site of Steve’s aforementioned success. The weather was great. Howard explored the area in his inflatable kayak, I caught up on some reading, and Steve returned humbled and empty-handed. So much for fishing on a sailing trip! That night, we enjoyed another of Steve’s hot dinners and competitive table games. Friday, our last full day on the water, started out great—dry with favorable winds—as we headed for Little Detroit en route to Little Current via McBean Channel. On the other side of Little Detroit, we encountered near-continuous rain showers, though the winds remained favorable all the way to Louisa Island, our nighttime destination. Shortly after setting anchor, we experienced an enormous downpour, but fortunately we quickly secured the hatches, and the evening dining and table game entertainment began. On our final morning, we had excellent weather and favorable winds as we sailed across McBean Channel and down Waubuno Channel to Little Current. We topped off the fuel tanks, pumped out, transferred our gear to the land vehicle, and returned Stryder to the charter staff. On our voyage home, we unanimously agreed that chartering was the way to go for future trips. Jerry Major got hooked on sailing in his early 20s when a friend built a kit boat. 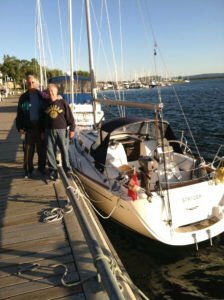 Owning several boats over the years, Jerry recently acquired a Catalina 30 Mark II, Irish Rover, that he sails out of Toledo Beach Marina on western Lake Erie. A member of Birmingham Power Squadron/9 for over 20 years, he served as treasurer for 13. He has benefited immensely from taking USPS courses. His article first appeared in the squadron newsletter, Bilge Chatter.